I’ve seen rice cheese single slices at the store in the past but was always disappointed to discover that they contained casein, which, of course, is a no-no for those of us with dairy allergies. Recently, I checked out the website of the makers of the Rice Slices, Galaxy Foods, and was pleasantly surprised to see that these slices have been re-formulated and now are completely dairy AND soy free! So, now they pass the ingredient test but do they taste any good? The answer is a surprising, “yes!” While this product isn’t exactly like dairy cheese, it does taste pretty good and the texture is very similar to the “singles” that you find in the dairy case. In an attempt to make macaroni and cheese, I cut a couple of the slices up and added them to some hot spiral rice noodles. The cheese melted nicely which made me optimistic about making a good batch of mac and cheese (this attempt wasn’t good enough to share with you – my sons wouldn’t touch the stuff – but maybe a mac and cheese recipe will appear in the Recipe Index in the future!) I also attempted to melt a slice on a hamburger. I should have put the cheese on much earlier in the grilling process because this cheese does take longer to melt than does its dairy counterpart. In the future, I would put it on right after flipping the burger. 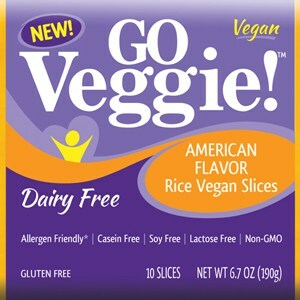 If you are allergic to dairy AND soy and have been looking for a cheese substitute that melts and tastes pretty good, give the Rice Vegan Slices a try!